Wedding band video shows Novell’s customization abilities. This item was originally included in our Novell News section on www.novelldesignstudio.com. Novell Design Studio, an American wedding band and bridal jewelry manufacturer with over 22 years in the jewelry industry, is proud to announce the launch of its latest online video brochure. This brand new video illustrates Novell’s unique customization capabilities with several wedding band morphing segments set to original music. 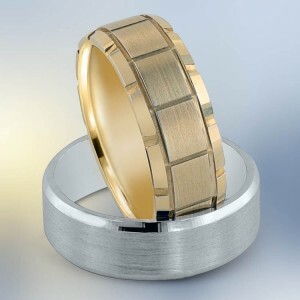 Any average consumer looking to purchase a wedding band can learn about what makes Novell different from nearly all other manufacturers; the ability to make almost all of their wedding band designs wider, narrower, in different metals (platinum, palladium or gold), with different finishes, and much more. Why settle for ordinary, when only the best American-made wedding bands and bridal jewelry should do? Custom wedding bands = wedding bands by Novell. Have you ever looked inside a jeweler’s showcase at wedding bands, and viewed a selection of styles that were close to what you have pictured in your mind, but not quite what you were envisioning? American wedding band manufacturer Novell can help solve that problem. Almost all Novell wedding bands can be made wider, narrower, in different metals (platinum, palladium or gold), with different finishes, and much more. Their customization capabilities set them apart from nearly all other companies vying for a more visible position within the wedding band industry landscape. Your wedding band can literally be made your way, and just for you in a relatively short period of time. 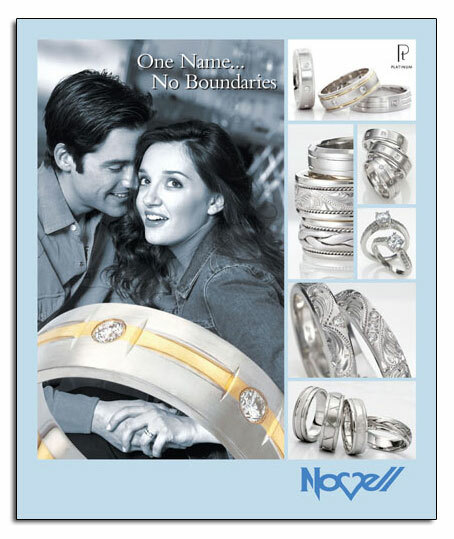 So when you think of the word “custom” and are looking for a wedding band with that special touch – think of Novell. Why settle for ordinary? Need a wedding band that is wider than what you see? No problem. Desire a wedding band style in another metal? Or white instead of yellow? No problem. Want the edge from one wedding band style, but the braid from another? And a finish that is similar to yet another? Still no problem!!! Custom wedding bands are Novell’s specialty. See actual wedding band customization examples by visiting Novell’s “Customize Your Wedding Ring” webpage on www.novelldesignstudio.com. To discuss all pricing and manufacturing options, please visit an authorized Novell wedding band retailer in your area. View EngagementMag101.com’s layout illustrating Novell’s customization capabilities. Custom wedding band = Novell wedding band. 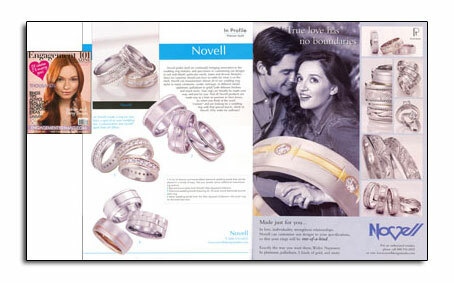 Almost every wedding band created by Novell can be a custom wedding band. Many Novell wedding bands can be made wider, narrower, in different metals (platinum, palladium, gold), with different finishes and much more. Your wedding band can literally be created just for you. Visit an authorized retailer for pricing and manufacturing options. Please note: You can have Novell wedding band news delivered directly to your desktop through Novell’s online RSS feed. Please visit CLICK HERE to subscribe. 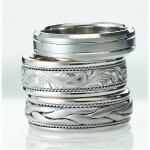 Novell's classic braided wedding band style P1706-6GC. 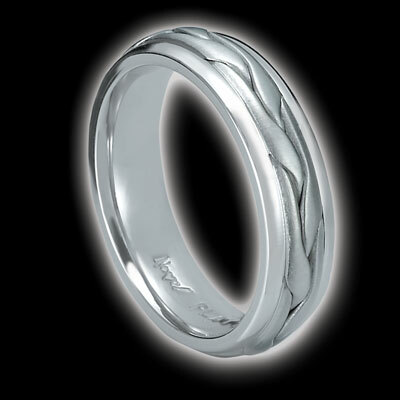 This wedding band is pictured in platinum, but can be made in palladium or gold as well. Custom wedding bands that can be made your way. A wedding band can be made just for you. And be as special as your wedding day. Novell can specially manufacture almost all of our wedding bands to be wider, narrower, in different metals (platinum, palladium, or gold), and much more. 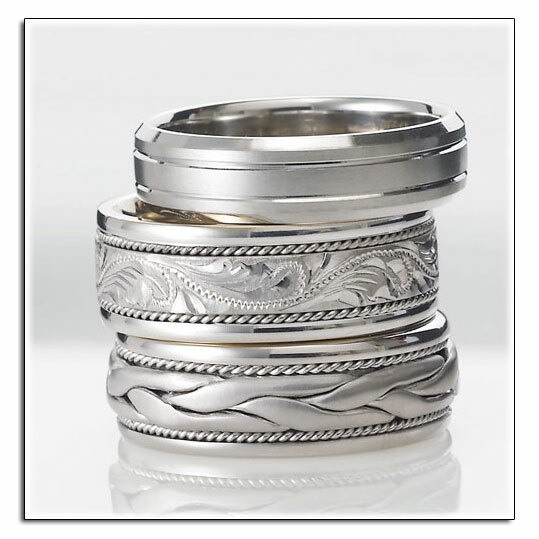 Novell wedding bands can be made wider, narrower, in different metals, and much more. Have you ever looked inside a jeweler’s showcase at wedding bands, and viewed a selection of styles that were close to what you have pictured in your mind, but not quite what you were envisioning? Wedding band manufacturer Novell can help solve that problem. Almost all Novell wedding bands can be made wider, narrower, in different metals (platinum, palladium or gold), with different finishes, and much more. Their customization capabilities set them apart from nearly all other companies vying for a more visible position within the wedding band industry landscape. Your ring can literally be made your way, and just for you within a relatively short period of time. 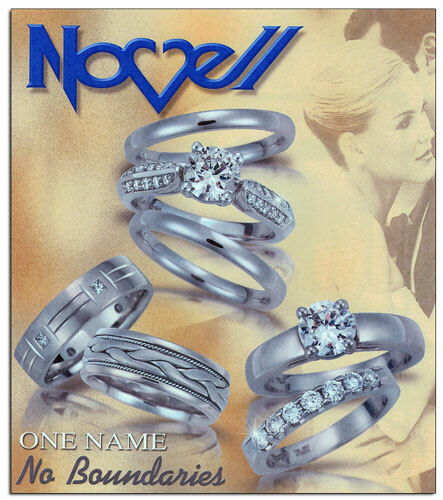 So when you think of the word “custom” and are looking for a wedding band with that special touch – think of Novell. Why settle for ordinary? Wedding band customization featured in Engagement 101. The new issue of Engagement 101 (a Wedding Dresses magazine) featured a company profile about Novell which highlights the company’s wedding band customization capabilities. Customization sets Novell apart from nearly all other wedding band manufacturers. Download the Engagement 101 feature. Wedding band customization highlighted in leading bridal magazine. Novell wedding bands can be created wider, narrower, in different metals, and more. Customize your wedding bands – why settle for ordinary? This article also appeared in Google News. Novell can make your wedding band – your way! 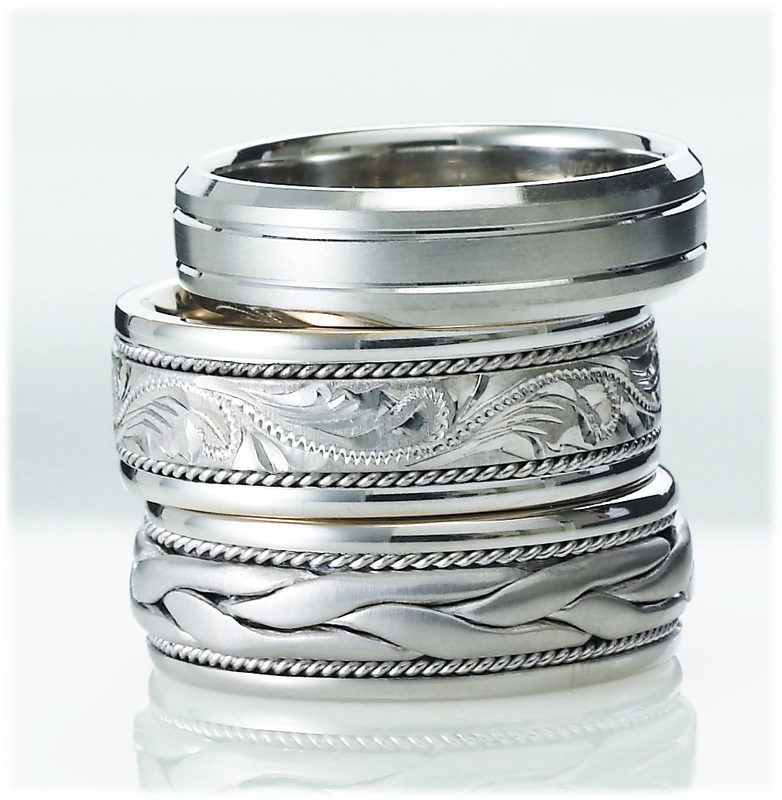 Novell can specially manufacture your wedding band or engagement ring in platinum, palladium or gold. For help with choosing the metal that’s right for you, please download Novell’s latest brochure, “Choosing the Right Metal for Your Bridal Jewelry.” Also feel free to download our other catalogs/brochures including Novell’s bridal jewelry catalog or the latest brochure for Max Squared Collection wedding bands. For all pricing inquiries or additional information about customizing your wedding band, please contact an authorized Novell retailer. Popular and classic wedding band designs by Novell. Novell wedding bands are specially created any way you want them! Novell wedding bands are made just for you. In love, individuality strengthens relationships. Novell can customize our designs to you specifications, so that your ring will be one of a kind. 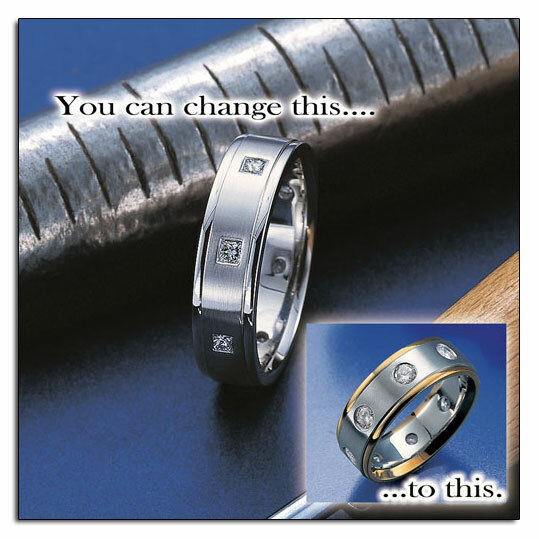 Customization sets Novell wedding bands apart from all others. Exactly the way you want it. Wider. Narrower. In platinum. Palladium. 5 kinds of gold. And much more. Novell wedding bands can be made wider, narrower, in different metals and more. Visit Novell’s “Frequently Asked Questions” section. Do you have questions about Novell wedding bands? Whether you are a retailer or consumer, feel free to visit our Frequently Asked Questions section to find the answer that you are looking for. And keep in mind that customization sets Novell wedding bands apart from the rest. Novell wedding bands can be made wider, narrower, in different metals and much more. Customization sets Novell wedding bands apart from all others. You have a style that is all your own. Your relationships are also unique as well. What better way to show your individuality and love than by designing your own wedding band? Novell Design Studio will help you create a one-of-a-kind wedding band that is just as expressive as the love you have for each other. All Novell wedding bands are made to order. The unbreakable bond between a man and woman is demonstrated with durable precious metals and everlasting diamonds. All our rings can be specially manufactured in platinum, palladium, 18kt gold or 14kt gold (in white, yellow or pink). You can add special decorative finishes, diamonds and colored stones to almost any style. Or you can combine features from several different designs into a brand new look. Our manufacturing flexibility ensures that no bride or groom has to settle for what’s in our showcase or on the catalog page. Novell takes great pride in our ability to meet your personal desires. All you have to do is visit one of our nationwide authorized retailers and tell them what your vision is. We’ll take it from there. Together, we can make your dream ring come true. Novell can customize almost all of our wedding band styles.